Get Prepared! 90-Day Action Plan Begins 9 April! Are you ready to take your business to the next level? Inspiration is at an all-time high after Celebration 2018 and now’s the time to keep the momentum going and get into action. The new 90-Day Action Plan begins 9 April and this week is all about preparing you for success. Head to ANZ.IsagenixBusiness.com to download our 90-Day Action Plan Booklet and let’s get started! Celebration 2018 was filled to the brim with world-class business training designed to help transform the way you approach business building. Get your 90-Day Action Plan inspiration by tuning in to Celebration 2018 at IsagenixLive.com/ANZ-Celebration from 3 April until 4 July 2018. For those who attended Celebration 2018, you’ll enjoy On Demand FREE. Those who didn’t attend can enjoy the same content for just $99. To help give you the push you need, we’re bringing you tips from the top through five 90-Day Action Plan-focused Zoom Calls with top leaders. From connecting and developing leaders, through to how to utilise the tools of offer and blitz your way through Blitz Week, you’ll receive training from leaders who have elevated their business through the 90-Day Action Plan. A well-developed ‘why’ will clearly and powerfully help you breakthrough unexpected obstacles and guide you as you prioritise your time, your focus and your talents. Commit to reasonable goals and celebrate achieving them. Recall why you want to share Isagenix with others. Remember that when you build good friendships the opportunity to share Isagenix will naturally happen. 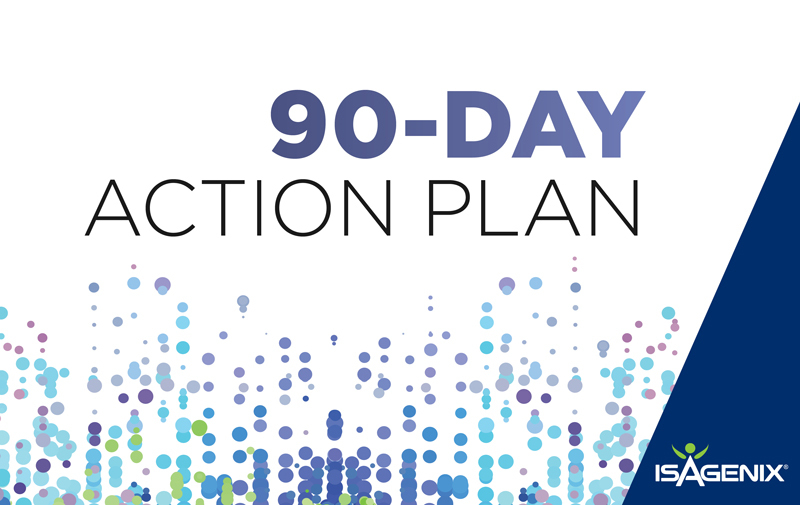 Head to ANZ.IsagenixBusiness.com to download your copy of the 90-Day Actin Plan. Read and fill out pages 2-27 of your booklet in preparation for the launch and stay tuned to the Isagenix Business ANZ Facebook group for Zoom Call announcements. Don’t forget, Celebration 2018 On Demand is on offer until 4 July 2018 so head to IsagenixLive.com/ANZ-Celebration to tune in. How far can you go in 90 days?